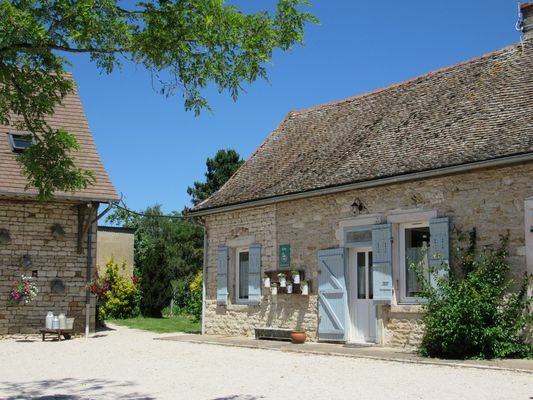 Gîte adjoining owners' home, separate entrance, 5 min. from Chalon-sur-Saône and 20km from Beaune. Single level accommodation: living room with fitted kitchen, opening onto dining area and lounge (TV, sofa bed), large bedroom (double bed, 2 single beds), shower room, WC. A tastefully renovated, practical and welcoming gîte. Private garden (150 sq. m.) with BBQ, slide. Parking. Gas-fired central heating (no extra charge). Internet access. Cot on request. EuroVélo6 3km (Nantes-Budapest cycle route). 'Voie verte' 3km (trail for walkers, cyclists, horse-riders, etc.). Chalon Nord motorway exit nearby.